Have fished every fish-able day since last post. Winter can be very peaceful and beautiful when the wind lays down, but requires a lot of patience. 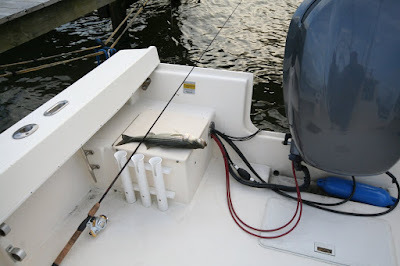 On March 5th I was fishing with buddy Brad and he picked up a keeper striper on the flats at Boyds point. I believe that the these resident striper's remain in the river year round, but rarely feed when the water is under 50. The wind was blowing hard tonight, but the air temp was over 6o. The water temp has been creeping up to 51-52. Fished the marina light with a Kastmaster and finally picked up a nice 18. Suprised the hell out of me and gave a very good fight. Walked her back to boat for a "seat picture" which confirmed she was a keeper. Quick pic and off she went.